Our mission on this project was to create the latest innovative range of rods in the well-established Shimano Starlo Signature Series (designed by Ian ‘Barra’ Miller). We wanted a set of classy sticks to fit alongside or just above the current Shimano Starlo ClassiX Series in terms of pricing, while gradually replacing the incredibly successful and popular Starlo StiX STP Tournament Pro range of more expensive, premium rods. In other words, to provide sports car performance at family sedan prices! The visual, tactile and cosmetic elements of these new Jungle StiX provide a mix of military and industrial, with a dash of urban guerrilla grunge! The overall impression is one of rugged toughness, individuality and powerful, deadly stealth… These sticks stand out in a crowd! Above all, these relatively high-modulus graphite rods are designed to put a tournament-standard rod with near-custom-built specifications into the hands of every Australian angler at a ridiculously affordable price… That was the brief, and we reckon we’ve hit the mark! With the money you’ll save on these amazing rods, you can upgrade to an even better reel… or possibly consider the purchase of a second outfit. Above all, these had to be rods that Starlo would actually choose to use in his personal, day-to-day fishing, whether shooting DVD and TV segments, competing in tournaments, researching magazine stories and blog features, or simply wetting a line socially with friends and family… And they are! Keep your eyes peeled and you’ll see one of these sticks in Starlo’s hands more often than any other! * These are only some of the more obvious uses for each model. They are versatile enough rods to cover many more options than those described here. ** These are suggested jig/sinker weights for the Jungle StiX 572 Heavy Spin, as it isn’t really intended as a casting rod. Jungle StiX Light Spins: Finesse Meets Power! The Jungle StiX 662 and 732 Light Spin rods share a few similarities, but are also quite different beasts. The feather-light 662 is the ultimate “flick stick”: a relatively short (6’ 6”) spin rod with a very light, whippy tip and a fairly soft, progressive action, yet it is also far from being “sloppy”. This is the crisp little tool you would choose when walking the banks of a high country trout stream while flicking spinners, little minnows and soft plastics for browns and rainbows, or to cast lightly-weighted natural baits for bream, whiting, garfish, mullet, tommy ruff (herring) and the like. By contrast, the 732 is a much gutsier stick with considerably more reach and authority, but remains light enough in the tip to throw tiny stick baits or unweighted plastics. The 732 is now Starlo’s favourite bream and flathead rod, as well as being his first choice when vibing for bass and golden perch or casting poppers and walk-the-dog topwaters at big whiting. Jungle StiX Medium Spins: The Snapper Twins! The Jungle StiX 702 Medium Spin and its slightly heavier, longer stablemate, the 742 Spin, are sure to see a lot of work tweaking plastics or float-lining baits for snapper right around the south of the continent. The 702 will most likely be the first choice of many snapper specialists in more open water, with the 742 being preferred wherever serious muscle needs to be applied to keep rampaging reds out of the kelp and reef. But these rods will catch a lot more than snapper! Light to medium pelagics including tuna, mackerel and kings, mulloway, mega-flathead, barra and Murray cod will all be grist to the mill for this impressive pair of multi-purpose “all-round” spin sticks. If you had to go anywhere and catch anything with just one rod… Well, it’d have to be one of these! Jungle StiX 922 Spin: A Shore Bet! This 9’ 2” Jungle StiX Spin rod has been designed specifically for Australian shore casting applications, especially when lure or bait fishing in the surf, from ocean rock ledges or off wharves, jetties and breakwalls. However, it will also be extremely useful for some boat fishing scenarios, especially where very long casts are required, such as when throwing metals or poppers at pelagics like mackerel, GTs, queenies and small to middle-weight tuna. The rod offers an optimum combination of length and power to facilitate long, effortless casting, while remaining light enough in the hand to minimise fatigue during lengthy fishing sessions. As with all the other Jungle StiX, this superlative stick features Sea Guides and other quality hardware throughout, along with that distinctive camouflage-themed paramilitary look and feel. Jungle StiX Baitcaster Rods: Two For Fighting! Modern baitcaster reels remain the optimum choice for many serious anglers targeting big, powerful fish while casting reasonably large lures and baits. The two Jungle StiX Baitcast Rods (the 571 and 622) are absolute weapons, designed to combine the very best in accurate casting with effortless fish-fighting power. Naturally, they feature the same Sea Guides, quality reel seats and eye-catching camouflage-based cosmetics as the rest of the distinctive Jungle StiX range designed exclusively for Shimano by Steve ‘Starlo’ Starling and Ian ‘Barra’ Miller. And being two-piece, the 622 will be especially popular amongst travelling sport fishers. Jungle StiX 572 Heavy Spin: The ‘Wrench’! 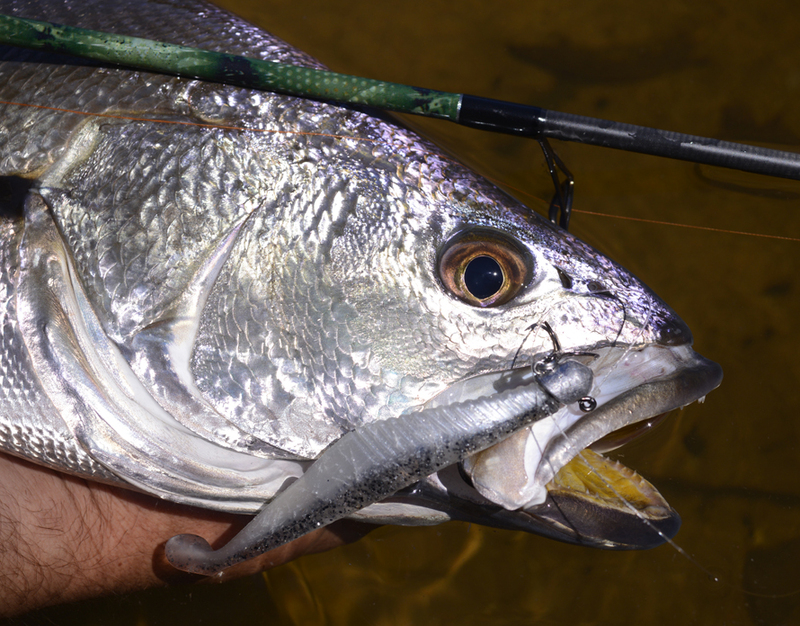 Our Jungle StiX heavy spin boat rod is a short, potent tool intended to take the hard knocks and withstand the serious strains of red-blooded offshore angling. Whether you’re dropping heavy metal for kings, drifting “cubes” and live baits down a berley trail for tuna, or muscling reef fish out of their jagged hidey-holes, this no-nonsense boat rod with its quality Sea Guides and premium hardware is definitely up to the task… Which is hardly surprising when you remember it was conceived, designed, fine-tuned and approved by two of Australia’s leading tackle technologists: Steve ‘Starlo’ Starling and Ian ‘Barra’ Miller. Little wonder we’ve nicknamed this weapon “The Wrench”!